1. It may be a little shocking, but National Static Electricity Day is January 9!! Do you often get shocked often when you touch metal? Here are some things to avoid! I do get shocked a lot! I do most of the things below, I just haven't tried carrying a metal pen. That might help me! The drier air of winter months is a better insulator than the more humid air of summer. To help prevent static electricity, use a humidifier to put moister back into the air in your home during the winter months. Our skin is drier in the winter months, too. Putting on moisturizer before getting dressed is recommended. Synthetic fabrics are better insulators than natural fibers. Wearing materials made from natural fibers such as cotton will help reduce the amount of static electricity that’s stirred up. 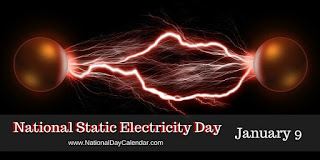 While walking around the house, at work or shopping, holding a key or a metal pen in your hand will help discharge the build-up of static electricity painlessly. Switching to leather soled shoes versus rubber-soled shoes will help reduce the amount of static that is built up. 2. There are actually two "National" days worthy of mention! 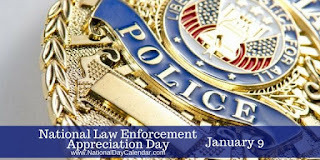 It is also National Law Enforcement Appreciation Day. Our men and women working in many areas of law enforcement put their lives on the line for us daily. 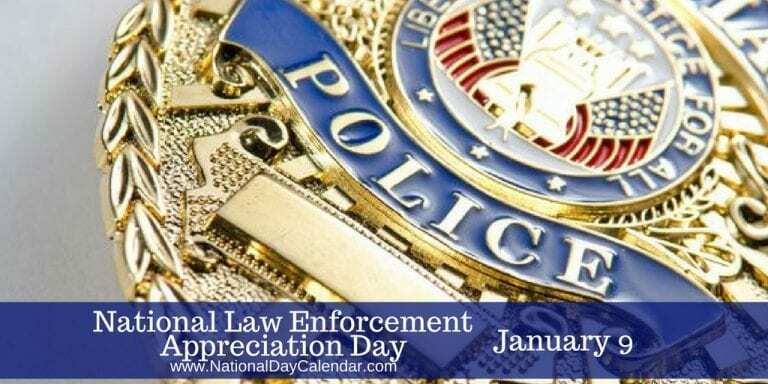 Do you know someone working in law enforcement who you can thank today? Well, I might be able to thank our school officer. His name is Officer Sean. He is usually really busy. I have some friends I went to college with that are detectives and such. I am not in contact with them much anymore. 3. At our house right now it is all about football. Joe's Philadelphia Eagles barely won their game on Sunday to move forward in the playoffs and another chance to play in the Super Bowl this year. Do you have a favorite team in the playoffs or does football make you yawn? Is there a Super Bowl party in your future, no matter the teams playing? I am a Kansas City Chiefs fan and we are still in the playoffs, we play the Colts on Saturday. We watch the Superbowl no matter who is in it. I enjoy the commercials and halftime. 4. Speaking of parties, there is always lots of food at parties I attend. Tell us a weird food combination that you really enjoy (or have enjoyed). It doesn't have to be party food. I am not sure if this counts or not, but I love candy corn mixed with peanuts. It tastes like a Payday...yummy! 5. Since we are on games and parties, what game have you spent the most hours playing? Several years ago there was a game on Facebook called Frontierville. I LOVED that game. It got to where it would not load on my computer though and I had to quit playing. 6. Tell us something random about your week so far. I started back to work on Monday, we had a meeting and the kids came back on Tuesday. I wanted to come home all day Monday, but when the kids came back, I was fine. Wednesday, I go get my hair done. I am excited about that. It is really long. I love paydays, I might try the peanuts and candy corn!! Hope your day is happy and blessed. btw, a soda jerk is a slang term for someone who works behind the counter serving soda/ice cream. Candy corn and peanuts mixed together is really good! Thanks for joining in on the Medley today!! Glad the kids are back and you can find your happy place again!